K9 Search and Recovery Scotland has been developed by Iain Marshall. 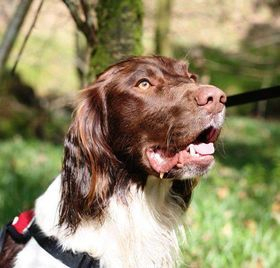 Iain is the owner, trainer & handler of his English Springer Spaniel, Barra. Iain and Barra are fully qualified as Human Remains Detection Dog & Handler - Land, Shoreline & Submerged. Barra is the ONLY qualified submerged human remains detection dog in Scotland. The team work together on the River Clyde, training most days & are now being tasked to search in various incidents. Barra was instrumental in locating his first casualty when he was still under training. K9 Search and Recovery is a charitable organisation and we do not charge for our services, however, donations are welcome to help cover expenses. The purpose of this website is to keep you up to date with the training they are doing & any jobs they are tasked to do . Please feel free to get in touch if you feel we can be of any assistance to you. Please note K9 Search and Recovery Scotland is in no way linked or partnered with any other organisation.